Promoting items related to the upcoming Great American Eclipse of 2017 (Aug. 21) can be a tremendous money-maker for your group or organization, and the source of a lot of fun — but you need to start now! If you’re located in a city along on the Path of Totality through the U.S., you’re really in luck! But even if you aren’t, you’ll probably have a partial eclipse that day, so you can get in on the fun, too. First, assume virtually every person alive Aug. 21 will want to check out the eclipse. 1–Since scientists warn everyone not to stare at the sun during the eclipse with regular sunglasses or the naked eye, everyone will need certified eclipse glasses. Sell them as a primary eclipse fundraiser. Decide a fair price to charge buyers (we charged $2 for the first 4,500 sold and $3 for the last 1,000 sold) — and promote the heck out of (1) The eclipse itself (2) The fact that everyone needs to wear approved glasses for safety (3) That it’s a great opportunity to conveniently buy glasses for family members, neighbors and friends. 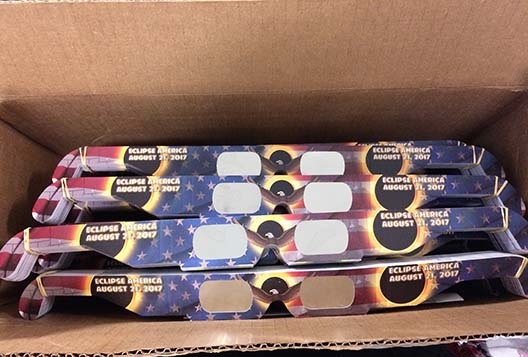 I’m on the board of directors of the employee services association where I work (which happens to be in the Path of Totality) — and we bought 5,500 pairs of certified eclipse glasses and they sold like hotcakes! (I’ve run a lot of fundraisers in that environment, but have never seen anything like this. The glasses almost sold themselves.) We raised nearly $9,000 while keeping employees and family and friends safe at the same time. We initially ordered 1,000 , and sold more than 500 of them during a one-hour period in our main office the first day we offered them for sale! The first two customers bought 30 pairs each. Volunteer sellers in other buildings who’d been given a supply to sell at the same time sold out quickly, too. One woman sold 50 glasses to a single buyer – and so did I! 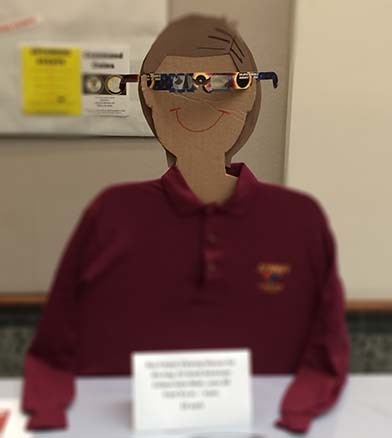 While waiting for the second order for 1,000 to arrive, we placed a life-sized cardboard “man” wearing a pair of the eclipse glasses in a high-traffic location, to draw attention. We displayed a sign in front of him stating that the first order of glasses sold out, and asking people interested in buying them to email me to be added to the waiting list. In the next two days, about 75 people ordered 247 more glasses. It went on from there, and we placed a total of 7 orders with the vendor, until they ran out of glasses! Before you undertake this sale, it’s a good idea to do the following things. Check with your legal department to be sure there are no issues. 2 — Plan eclipse- and solar-related events to hold the day of the eclipse and the week before the Monday eclipse — for a week-long Eclipse Celebration. Google “eclipse parties” and check Pinterest for eclipse fundraiser ideas, too. Hold eclipse- and solar-related food sales. 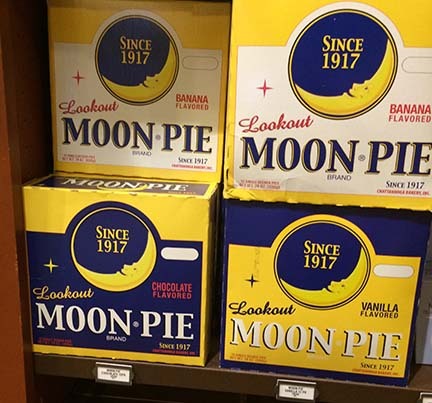 Buy wholesale and sell moon pies, Mars and Milky Way candy bars, sun tea, starlight mints, Tang and more. If the food you want to sell doesn’t have an “eclipsey” name already, invent your own — offer Ring Around the Moon donuts, for example. Sell commemorative eclipse stamps from the U.S. Post office; sell one Forever stamp for $1 and save people the trip to the post office. These stamps are made to transition from one scene to another by warming them; however, I sat on them and did everything I could think of — but couldn’t make them do it! They’re still a nice memento. Hold an eclipse celebration bake sale and contest. 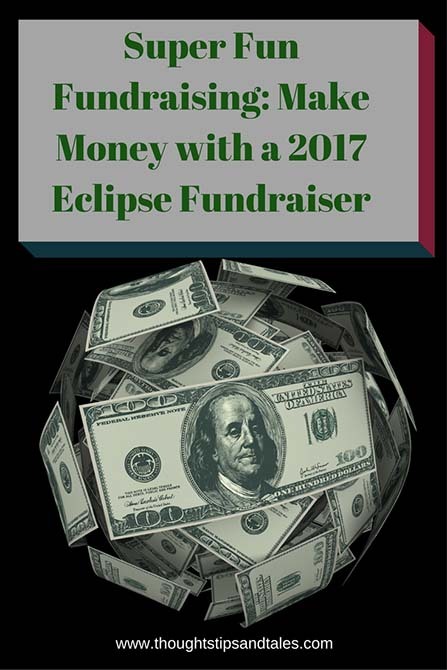 Ask employees to donate baked goods with eclipse- and solar-related themes and award prizes (maybe a few pairs of eclipse glasses?) to the winners with the most creative donations. You may be surprised what they’ll come up with — everything from “moon” (round) cookies and eclipse bars to cakes with craters and an American flag (to symbolize moon exploration) or ones with planets surrounding it. Sponsor eclipse celebration contests and award prizes to the winners. Publish an eclipse fact-a-day in an employee publication, on bulletin boards, etc. While this doesn’t earn money, it does generate interest. Print and display eclipse celebration signs in prominent locations; also, set up a “countdown to the eclipse” digital sign that shows the hours and minutes until the eclipse occurs. Let your imagination go wild and have fun with it! After all, this eclipse will be a once-in-a-lifetime event for most people — so live it up. This entry was posted in fun, fundraising ideas, saving money and tagged charity fundraising ideas, eclipse fundraiser, fun fundraiser, fundraiser, fundraising ideas, super fun fundraiser. Bookmark the permalink.